U.S. AIR FORCE ACADEMY, Colo. — Three retired generals and a retired colonel were added to the Air Force Academy’s Distinguished Graduate list, the Academy announced April 3. 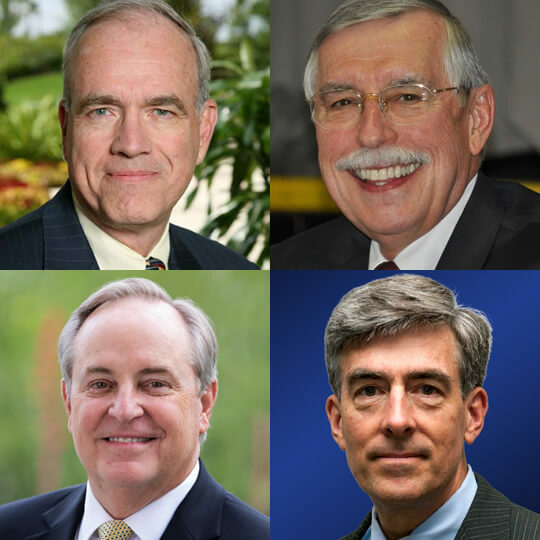 Retired Generals Chris Inglis, Edward Jayne, Mark Welsh and H. Michael Lambert, a retired colonel, are scheduled to be recognized at the Academy’s Founder’s Day Lunch, 11:30 a.m., April 5. Inglis flew T-37 and C-141 aircraft and taught at the Naval Academy. He joined the Air National Guard in 1985 and went on to become deputy director of the National Security Agency. Inglis received the Presidential National Security Medal from President Barack Obama and helped establish the cyber and computer science department at the Academy. Lambert, a respected ophthalmologist, was a T-38 aircraft instructor pilot before earning a medical degree at the Baylor College of Medicine, Texas. He was assigned to Wilford Hall Medical Center at Joint Base San Antonio, Texas, and became its chairman of ophthalmology and chief surgeon. Lambert regularly appears on national top-physician lists. Jayne served two combat tours during the Vietnam War and at the White House under Presidents Richard Nixon, Gerald Ford and Jimmy Carter. While serving in the Air National Guard, his corporate positions included: president of the McDonnell Douglas missile systems company; vice President of the F-15 Eagle program; and vice president of General Dynamics. He’s a partner with the executive search firm Heidrick & Struggles. Welsh is a former Air Force chief of staff, commandant of cadets at the Academy, and pilot with more than 3,000 flying hours in F-16, A-10, T-37 and TG-7A aircraft under his belt. He’s now the dean of the Bush School of Government and Public Service at Texas A&M University.